Download "COST & BREAKEVEN ANALYSIS"
3 Technology Short-Run Cost-Output Relationship Once the firm has invested resources into the factors such as capital, equipment, building, top management personnel, and other fixed assets, their amounts cannot be changed easily. Thus in the short-run there are certain resources whose amount cannot be changed when the desired rate of output changes, those are called fixed factors. There are other resources whose quantity used can be changed almost instantly with the output change and they are called variable factors. 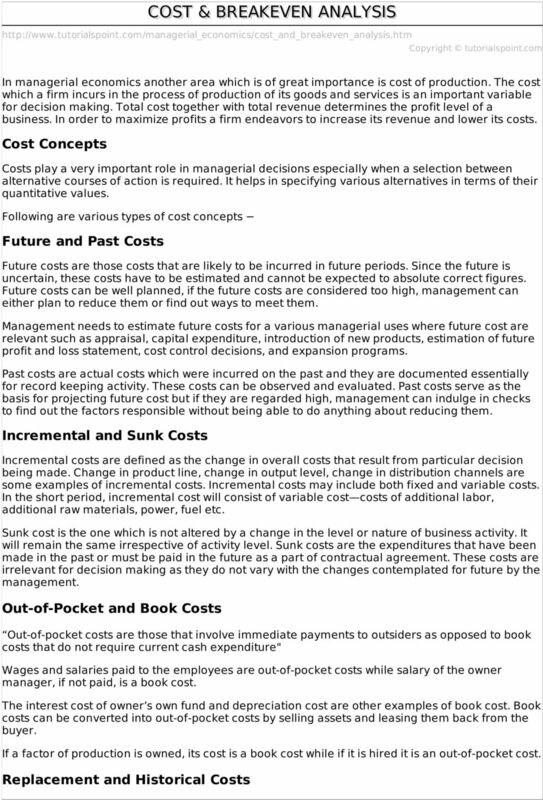 Since certain factors do not change with the change in output, the cost to the firm of these resources is also fixed, hence fixed cost does not vary with output. Thus, the larger the quantity produced, the lower will be the fixed cost per unit and marginal fixed cost will always be zero. On the other hand, those factors whose quantity can be changed in the short-run is known as variable cost. Thus, the total cost of a business is the sum of its total variable costs TVC and total fixed cost TFC. 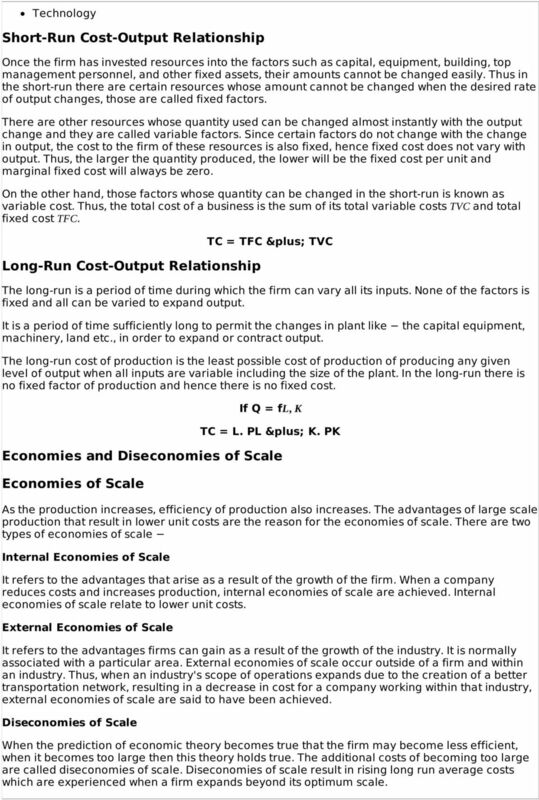 Long-Run Cost-Output Relationship TC = TFC &plus; TVC The long-run is a period of time during which the firm can vary all its inputs. None of the factors is fixed and all can be varied to expand output. It is a period of time sufficiently long to permit the changes in plant like the capital equipment, machinery, land etc., in order to expand or contract output. The long-run cost of production is the least possible cost of production of producing any given level of output when all inputs are variable including the size of the plant. In the long-run there is no fixed factor of production and hence there is no fixed cost. If Q = fl, K TC = L. PL &plus; K. PK Economies and Diseconomies of Scale Economies of Scale As the production increases, efficiency of production also increases. The advantages of large scale production that result in lower unit costs are the reason for the economies of scale. There are two types of economies of scale Internal Economies of Scale It refers to the advantages that arise as a result of the growth of the firm. When a company reduces costs and increases production, internal economies of scale are achieved. Internal economies of scale relate to lower unit costs. External Economies of Scale It refers to the advantages firms can gain as a result of the growth of the industry. It is normally associated with a particular area. External economies of scale occur outside of a firm and within an industry. Thus, when an industry's scope of operations expands due to the creation of a better transportation network, resulting in a decrease in cost for a company working within that industry, external economies of scale are said to have been achieved. Diseconomies of Scale When the prediction of economic theory becomes true that the firm may become less efficient, when it becomes too large then this theory holds true. The additional costs of becoming too large are called diseconomies of scale. Diseconomies of scale result in rising long run average costs which are experienced when a firm expands beyond its optimum scale. 4 For Example Larger firms often suffer poor communication because they find it difficult to maintain an effective flow of information between departments. Time lags in the flow of information can also create problems in terms of response time to changing market condition. Contribution and Breakeven Analysis Break-even analysis is a very important aspect of business plan. It helps the business in determining the cost structure and the amount of sales to be done to earn profits. It is usually included as a part of business plan to observe the profits and is enormously useful in pricing and controlling cost. 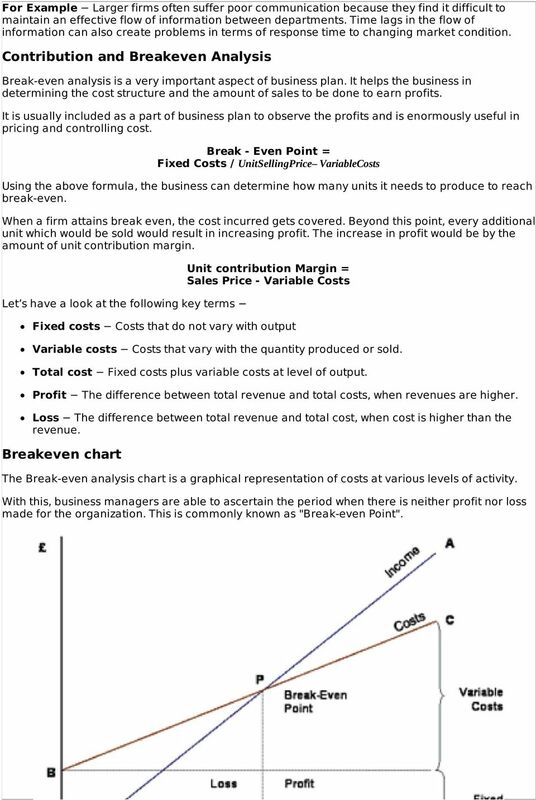 Break - Even Point = Fixed Costs / UnitSellingPrice VariableCosts Using the above formula, the business can determine how many units it needs to produce to reach break-even. When a firm attains break even, the cost incurred gets covered. Beyond this point, every additional unit which would be sold would result in increasing profit. The increase in profit would be by the amount of unit contribution margin. Let s have a look at the following key terms Unit contribution Margin = Sales Price - Variable Costs Fixed costs Costs that do not vary with output Variable costs Costs that vary with the quantity produced or sold. 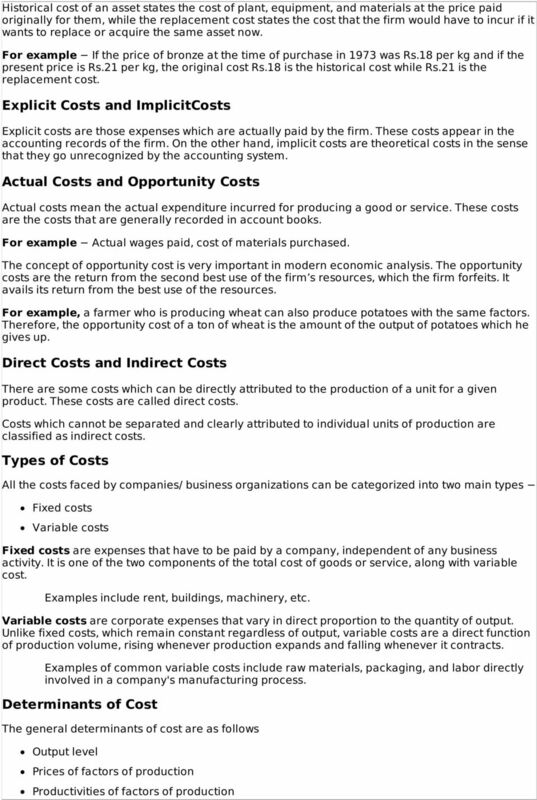 Total cost Fixed costs plus variable costs at level of output. Profit The difference between total revenue and total costs, when revenues are higher. Loss The difference between total revenue and total cost, when cost is higher than the revenue. Breakeven chart The Break-even analysis chart is a graphical representation of costs at various levels of activity. With this, business managers are able to ascertain the period when there is neither profit nor loss made for the organization. This is commonly known as "Break-even Point". Cost OVERVIEW. WSG6 7/7/03 4:36 PM Page 79. Copyright 2003 by Academic Press. All rights of reproduction in any form reserved. What is a cost? What is an expense? Ch 6- Name: Class: Date: Multiple Choice Identify the choice that best completes the statement or answers the question.